where X E [0,4] (yes, machine00 needs to be able to SSH to itself). Pro-tip: having network storage attached to all the machines makes this step unnecessary. 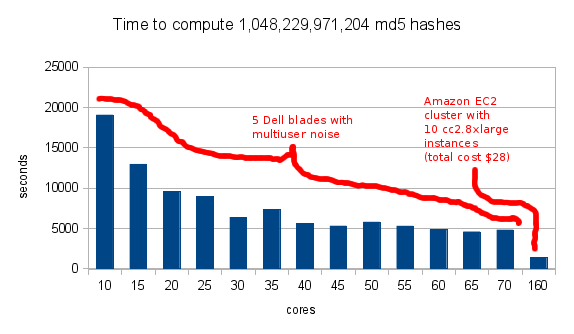 where Y is the number of cores each machine in your cluster has. 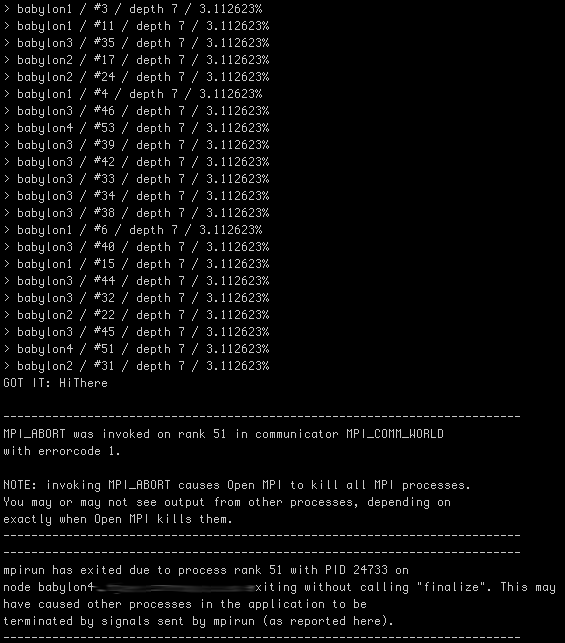 If you are running this on machines with 2 CPUs with 8 cores each, Y = 8 * 2 = 16. For the purpose of testing crackzor, we give it the md5 hash of an 8 character word and tell it to bruteforce it up to 7 characters. This insures that we will compute every permutation up to 7 character longs. The characters I asked it to permute are “abcdefghijklmnopqrstuvwxzyABCDEFGHIJKLMNOPQRSTUVWXYZ”, our sample space size is thus 52^7 + 52^6 + 52^5 + 52^4 + 52^3 + 52^2 + 52^1 = 1,048,229,971,204. 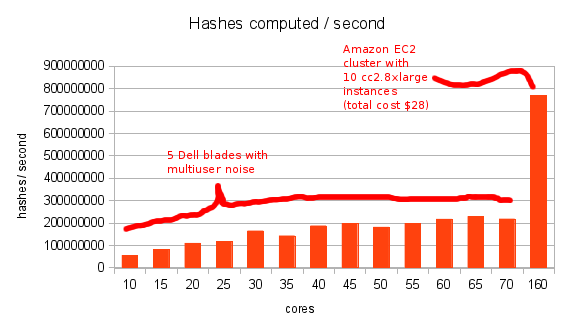 Ideally I would run through a few iterations of EC2 to observe its progression but hey, it’s expensive :). Right now, the only hashing algorithm supported by crackzor is MD5. It can very easily be expanded upon. I also may not be using the fastest MD5 method with the fastest call, distribution is what I’m interested in. 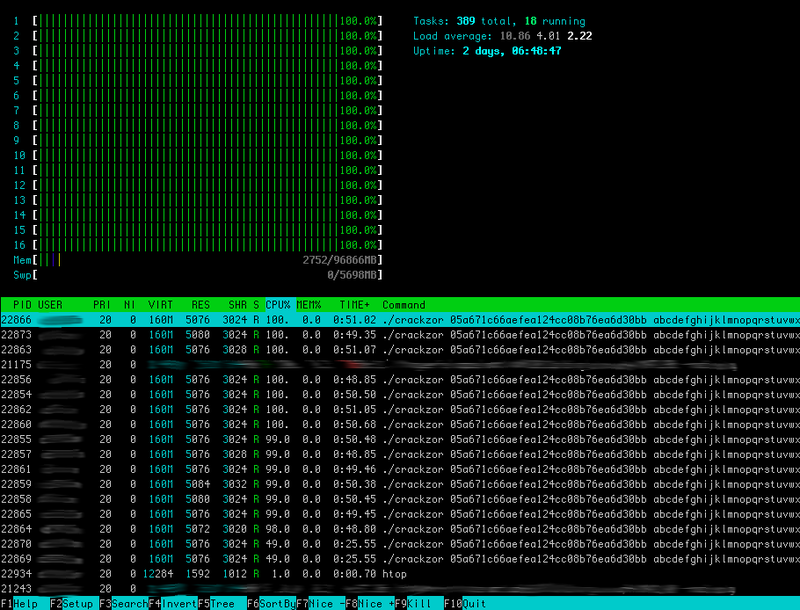 Distributing password cracking among multiple machines is throwing linear resources to an exponential problem!